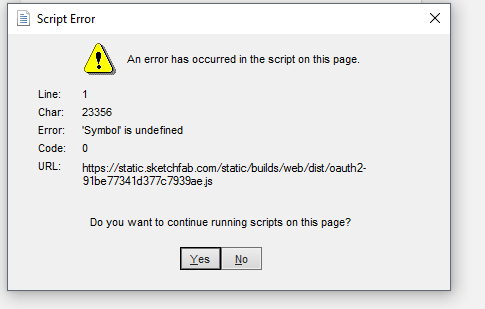 Whenever I go to upload any model to sketchfab from reality capture I get this syntax Script error. Is there anyway around this? What browser (and version) is that? Is it your default browser that Reality Capture is opening for the authorization process? Ok thanks, I’ll need to check. At first glance it looked like a issue with IE. We were able to reproduce the issue. We’re looking into it! I am also having trouble uploading from CR to Sketchfab. were you able to find a solution to this error? Hmm, I haven’t seen this error before. What happens if you click Yes to continue running scripts on the page? This started happening today when trying to upload to sketch fab from reality capture. Continuing to run scripts just makes it load forever. We’re looking into it with the RealityCapture team.